Arnold Dorsey was already popularly known by his friends and family as 'Gerry' when he decided to become a singer during the mid-1950s. Although he gained some national fame and popularity as 'Gerry Dorsey', none of the singer's singles got near the chart. By the mid-1960s even this moderate success was beginning to wane and his recording career looked close to its end. Fortunately, during 1966 he had a chance meeting with Gordon Mills, an old show business acquaintance, who was then managing Tom Jones. 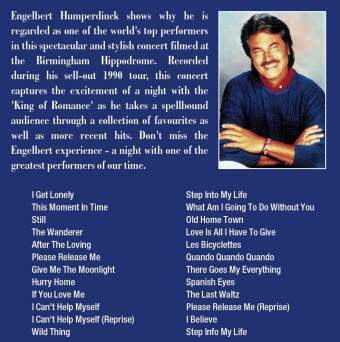 Mills persuaded the singer to change his name to Engelbert Humperdinck and also helped him secure a recording deal with Decca. The name change alone did not alter Gerry's fortunes because his first two singles in the new guise floundered. However the third attempt, 'Release Me', which was an old song and had previously been successful in the US for Esther Phillips, became a huge international hit. Immediately the luckless 'Gerry Dorsey' had been transformed into 'Engelbert Humperdinck' international 'Mega-Star'- outselling even Mills' Tom Jones. A stream of huge MOR hits based on romantic ballads followed and just like Tom Jones, Humperdinck moved himself to the upmarket American Night Club scene.